Finally, there is a solution that puts you in control by making yearbook publishing simple and economical. 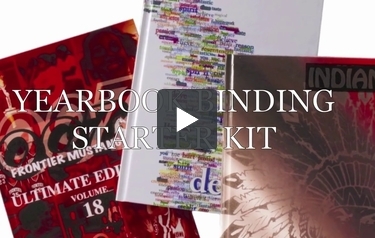 MyBinding.com is proud to offer Yearbook binding starter kits. Choose from either the Pro-Bind 1000 or Pro-Bind 2000. Each kit includes a high quality hard case thermal system and a set of 50 hard covers available in a variety of colors and cover finishing options like plain cover, foil stamping, or full color printed. Each kit also includes the Pro-Bind Hard Cover crimper, allowing you to finish your hardcover yearbooks with the style and durability you expect from a fine quality yearbook. Check out the options today and give us a call if you have any questions. Highly economical and effective binder. Positioning guides for improved binding quality. Compatible with: Fastbind Case Makers, Fastbind Presso. Includes a professional heavy duty stapler - rugged yet lightweight. Complete workstation for highly economical and effective binding. Easy to use positioning guides for most common formats. Ergonomic design with shelves to store supplies. Binds any format from A6 up to SRA3. Built-in hard cover setter unit. Binds any format up to SRA3. Compatible with: Fastbind Case Makers, Fastbind Creasers, Fastbind Presso. Welcome to MyBinding video. Finally, there’s a solution that puts you in control by making yearbook publishing simple and economical. MyBinding.com is proud to offer yearbook binding school starter kits. Choose from either the ProBind 1000 or ProBind 2000 kits. Each yearbook binding kit includes a high-quality hard case thermal binding machine and a set of 50 hard covers available in a variety of colors and cover finishing options, like plain cover, foil stamping or full color cover printing. And both kits contain the ProBind hard cover crimping machine. This allows you to finish your hard cover yearbooks with the style and durability you expect from a fine quality hard cover book. But you can also think outside this box because the same exact system is used for rebinding broken books from libraries. No matter which way you choose, give us a call and we can walk you through the whole process and find the best solution for you. And our website is filled with all kinds of how-to and demonstration videos so you know how to use your machine and make your product. When image matters, MyBinding.